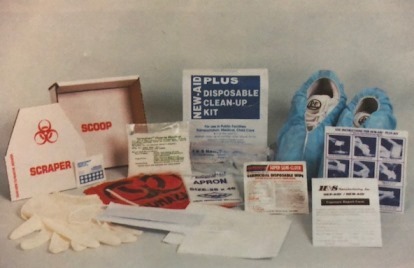 New-Aid Plus Disposable Clean-Up Kit manufactured by H & S Manufacturing contains all of the contents of the NA-123 plus the PPE to protect the person cleaning up the body fluid. It contains the necessary items to clean up a bodily fluid spill when involving vomit, urine, feces and blood. The New-Aid pathogen kit comes shrink wrapped in a compact size (6" x 7" x 2-3/4"). The contents and instructions are visible on the outside of the kit for ease of use. Recommended by the Center for Disease Control (CDC) and the U.S. Department of Health & Human Services (HHS). Clean-Up kits are sold by the case and each case contains 12 kits. Discounts apply to case quantities.